In 1935, sportsmen from throughout Missouri came together to form the Conservation Federation of Missouri (CFM). They organized with the purpose of taking conservation out of politics. 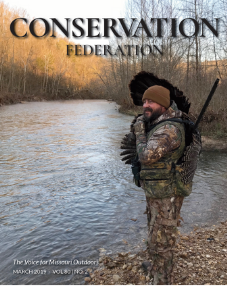 Their initiative petition campaign resulted in the creation of the Missouri Department of Conservation, a non-political conservation agency that has been a model for other states. Since then, the Federation has undertaken many successful battles to ensure Missouri continues to be the leading state in conservation policies and funding. In 1976, CFM spearheaded successful passage of the conservation sales tax to create stable broadbased funding for Missouri’s forests, fauna and fish. Today CFM is the largest and most representative conservation group in Missouri. It is a citizen’s organization with over 90 affiliate organizations and thousands of members. CFM is the Missouri affiliate of the National Wildlife Federation. If you are interested in more information on the history of conservation in Missouri, you might find Man and Wildlife in Missouri by Charles Callison of interest. The book examines “how the people of Missouri used, abused and attempted to restore and manage their wildlife and forest resources” (Callison foreword).